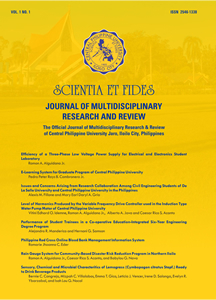 Scientia et Fides: Journal of Multidisciplinary Research and Review. It is the official journal of Higher Education Publication of Central Philippine University (ISSN 2546-1338) is internationally refereed, comes out semi-annually and is being uploaded here in this page. Our University appreciates and encourages the value of authorship and publication, especially among our faculty and staff. Thus, if you have conducted a research work, we are inviting you as well as your faculty and staff to publish it in our journal. However, we are requesting you to revise your manuscript to conform to the APA format for journal publication. If you wish to submit your paper, kindly contact Ms. Claire Fernandez at the following contact details: tel/fax no. : (033) 329-1971/329-0265 or you can e-mail us at cpu.researchjournal@gmail.com so that we can email to you the guidelines for Basic APA format and a sample paper from the first volume of Scientia et Fides journal. The deadline for submission of manuscripts will be on January 25, 2019.